COLORADO SPRINGS — An Israeli lunar lander originally built to win a prize competition crashed onto the surface of the moon April 11 when its main engine malfunctioned during descent. 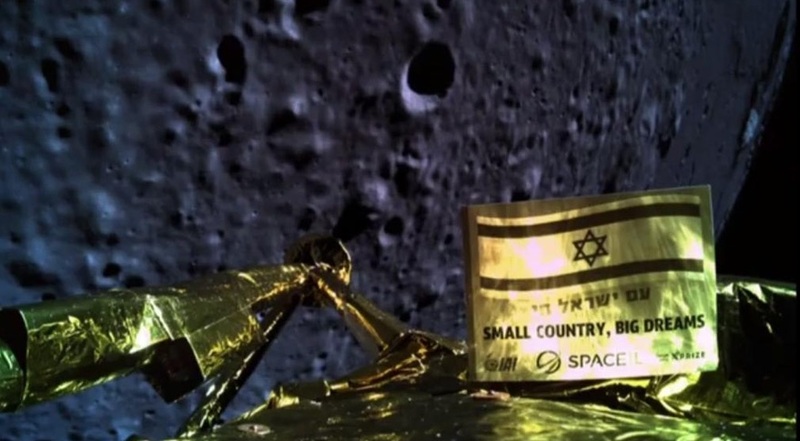 Beresheet, built by Israel Aerospace Industries (IAI) for non-profit organization SpaceIL, was attempting a landing in the Mare Serenitatis region of the moon at about 3:25 p.m. Eastern after spending the past week in orbit. The initial phases of the landing, including firing of the lander’s main engine, appeared to go well, and the lander returned an image during its descent from an altitude of 22 kilometers. However, the lander suffered a problem with that main engine later during its descent. Controllers tried resetting the spacecraft’s systems to get the engine working again, but that effort appeared to be too late to salvage the landing. “We had a failure of the spacecraft. We unfortunately have not managed to land successfully,” said Opher Doron, general manager of the space division of IAI, during a webcast of the landing attempt from mission control in Israel. He noted Israel was only the seventh country to place a spacecraft into orbit around the moon, and would have been the fourth country to make a soft landing on the lunar surface. Beresheet launched Feb. 21 as a secondary payload on a SpaceX Falcon 9 rocket, which released the spacecraft into an elliptical orbit around the Earth. The spacecraft subsequently performed a series of maneuvers to raise the apogee of its orbit to more than 400,000 kilometers. Beresheet entered orbit around the moon April 4. It subsequently performed several maneuvers, including one April 10 that placed the spacecraft into an orbit that came as close as 15 to 17 kilometers above the surface, setting it up for the landing attempt. SpaceIL initially formed as a Google Lunar X Prize team, seeking the $20 million grand prize the X Prize Foundation offered to the first privately developed spacecraft to land on the surface, travel at least 500 meters and return images and video. That competition started in 2007 and, at one point, had more than two dozen competitors around the world. While many other teams were companies that had long-term plans to fly a series of missions, SpaceIL designed its mission as a one-time effort, funded philanthropically, to stimulate interest in science and engineering among Israeli students. SpaceIL continued its mission even after the grand prize expired in March 2018 when Google declined to provide another extension to a competition that had an original deadline of the end of 2012. The X Prize Foundation, though, offered a $1 million “Moonshot Award” to SpaceIL if it was successful in landing on the moon. However, prize officials announced immediately after the crash landing that they would give SpaceIL the $1 million for coming close to the landing. IAI has expressed an interest in using that platform for future missions. The company announced an agreement with German company OHB in January to study its use for future ESA missions. “We’re taking the lander to market,” said Meir Nissim Nir, director of advanced space systems at IAI, during a presentation at Microsymposium 60 lunar exploration workshop last month outside Houston. The company is making “small modifications” to the lander design, he said, to allow it to accommodate 30 to 60 kilograms of scientific payloads, depending on whether the spacecraft is launched directly to the moon or placed into a transfer orbit like Beresheet. The landing attempt was closely watched around the, including by NASA. “While NASA regrets the end of the SpaceIL mission without a successful lunar landing of the Beresheet lander, we congratulate SpaceIL, the Israel Aerospace Industries and the state of Israel on the incredible accomplishment of sending the first privately funded mission into lunar orbit,” NASA Administrator Jim Bridenstine said in a statement.